Unpopular as this opinion may be, we have been little impressed by the recent activities and incarnations of Marina Abramović, the much-acclaimed “Grandmother of Performance Art.” Of course, as feminists, artists and art historians, we both have the utmost respect for the work she produced in the 1960s and 70s and her unflinching interrogation of the social, sexual and market conditions governing bodies in the western world. Those profoundly personal, visceral, and often violent performances initiated important debates about art, interaction and sexual politics that remain relevant to this day. But the political potency of that body of work and everything it altered or inspired, has felt nothing if not undermined by the aggressive manufacturing and marketing of “Marina” as an icon, an idol, a brand. Over the past decade, her unapologetic vanity, over-sexualized identity and Napoleonic narcissism—so fundamentally at odds with her earlier bearing of the body’s most base instincts and actions—has been well documented. Her transformation culminating in that great Abramaganza that was her 2010 retrospective at the MOMA, “The Artist is Present,” and the accompanying film produced to document the event. Holding court in the gallery’s atrium for 716 hours and 30 minutes, Abramović offered visitors the opportunity to sit across from her for as long as they chose while she silently stared into their eyes. The exhibition was wildly successful, drawing over 750,000 spectators who set up camp outside the museum and waited for hours on end to take their turn. The work reaffirmed the artist’s capacity for endurance and interpersonal engagement, but also revealed the powerful appeal of idol worship, the widespread and desperate need for attention, and the ever-expanding cult of celebrity, as present in the art world as in any other entertainment industry. With all that considered, it is no wonder that when we headed to Toronto last week to attend a series of Abramović-oriented events at the 2013 Luminato Festival, we did so with some prejudice and admittedly oppositional intent. We had an art historical score to settle. For two full days we immersed ourselves in an Abramovironment that seduced and unsettled us, charmed and repelled us, called our preconceptions into question and yet solidified our skepticism. First we attended the The Life and Death of Marina Abramović, a play of epic proportions created by Robert Wilson, scored by Antony (of Antony and the Johnsons), and starring the artist herself, Willem Defoe and a solid cast of actors, singers and dancers. An audio-visual onslaught, both beautiful and somewhat grating, the play left us with mixed feelings. The sets and costumes were stunning, to be sure, and it must be said that there are few things in the world like Antony’s voice. The audacious attempt to both humanize and immortalize Abramović was, however, somewhat jarring and more than a little exhausting. 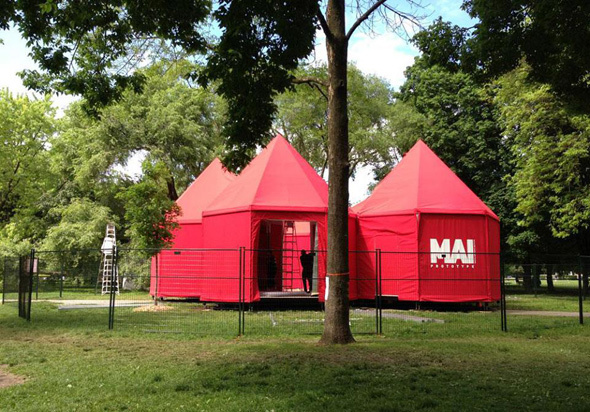 The following morning we ventured to an appointment at the mysterious MAI (Marina Abramović Institute) Prototype in Trinity Bellwoods Park. Advertised as an opportunity for visitors to “engage in exercises and experiences based on Abramović’s past work,” the MAI Prototype occupied a multi-chamber red tent that looked like the big top in a circus directed by David Lynch. We were greeted by a pleasant woman in a lab coat who guided us, and two other participants, into the tent’s lobby. If the outside smacked of Twin Peaks or Mulholland Drive, the inside appeared straight out of Tarkovsky’s Solaris. It was a futuristic environment with white curtains for walls, an IKEA-like aesthetic and closed-circuit cameras in every room. We were asked to sign a contract saying that we would not leave the tent or cause any type of disruption for the two-hour duration of the experience, as well as a waiver agreeing to our constant surveillance and online streaming. We were stripped of all our belongings, our jackets, jewelry and shoes and asked to change into starchy white robes and what appeared to be the felt liners of winter boots. We were equipped with ipods and headphones through which Abramović’s heavily accented and oddly enchanting voice fed us directions. Slowly making our way through seven chambers, we followed instructions and engaged in a series of activities and experiments: we performed breathing exercises; drank water infused with the healing properties of exotic-looking crystals and minerals; sat amongst quartz-embedded chairs for spirits to rest on while we silently stared into each others’ eyes; conducted electricity with light-saber-like wands in an unconvincing ode to Tesla; and lay on wooden platforms with dark concave crystals for pillows, meditating on feelings of weightlessness and luminosity. If this all sounds suspiciously flaky, New Age-y and slightly absurd… it was. It was all of the things we tend to deride or at least avoid. However, we did emerge from the experience with a sense of balance, elation, and calm that cannot be denied. It was like we had gone to a spa or retreat, a luminous spacious pause in the middle of the day and in the center of a busy city. We found ourselves wandering down Queen Street West in a sort of trance before finally discussing the experience. One chamber stood out in particular: the room in which we sat (apparently in the presence of spirits) and stared at each other in a re-creation of Abramović’s The Artist Is Present. For thirty minutes or so, we sat motionless and silent, staring into one another’s eyes. 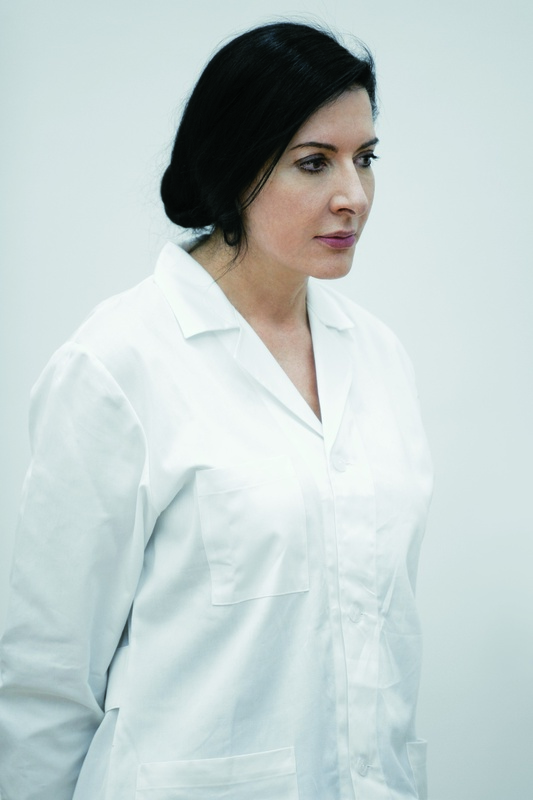 Abramović’s voice instructed us to blink as little as possible and resist the urge to laugh. At first that seemed like an impossible request as we tend to regress to a pre-adolescent state when asked to sit quietly across from one another and at best possess the maturity of scheming siblings or restless children at church. (We spent most of our graduate classes struggling to suppress our laughter and avoid one another’s eyes in the hopes of sustaining an aura of adulthood with little success and this felt a 100 times sillier than school ever had.) As time wore on, however, the corners of our mouths stopped twitching, our shoulders relaxed and we became fully immersed in the oddly intimate experience of mutual gazing. Neither of us had ever spent so much time staring into the eyes of another person. Lovers are rarely even afforded such concentrated and unflagging attention. It was, in fact, no easy task. Our eyes watered and weighed heavily from not blinking and it almost became difficult to hold up our heads. If thirty minutes of this was so hard, we couldn’t imagine taking on another 700 hours. There came a point at which it felt like we were looking through each other’s eyes, seeing ourselves reflected in each other’s faces. Obviously our experience was somewhat different than it would have been for participants paired with strangers. We had to broach the subject once regaining some distance from the event: Had our relationship been transformed by the paying of such excessive attention to one another? Did we have some sort of illicit and meditative affair? Were we dating now? We also both admitted that while horizontally reflecting on luminosity, or what have you, in the “lying down chamber,” we had each fallen asleep—a testament to the surprising sense of security we must have felt in the space and the extent to which we had suppressed or suspended our skepticism. Neither of us had expected to feel the way we did about the experience. We had been asked to relinquish a certain level of control, knowledge and criticality and to put all of our trust in the situation. Of course it entailed a certain suspension of disbelief which was oddly easy when we were in the tent. As the day wore on, however, we began to regain a sense of critical distance and the effect slowly subsided. While we cannot deny that the experience itself was incredible and won’t be easily forgotten, we were certainly in a different state of mind after attending Abramović’s lecture that same evening. An equally performative platform, the artist occupied a stage at Winter Garden Theatre and oscillated seamlessly between self-deprecating charm, humour and ambition. She exuded an air of both knowledge and naïveté that is seductive even if it is constructed. After providing a brief history of performance art and showing a series of incredible video excerpts documenting both her own and other artists’ previous performances she began to discuss the Marina Abramović Institute that she intends to open in Hudson, NY. 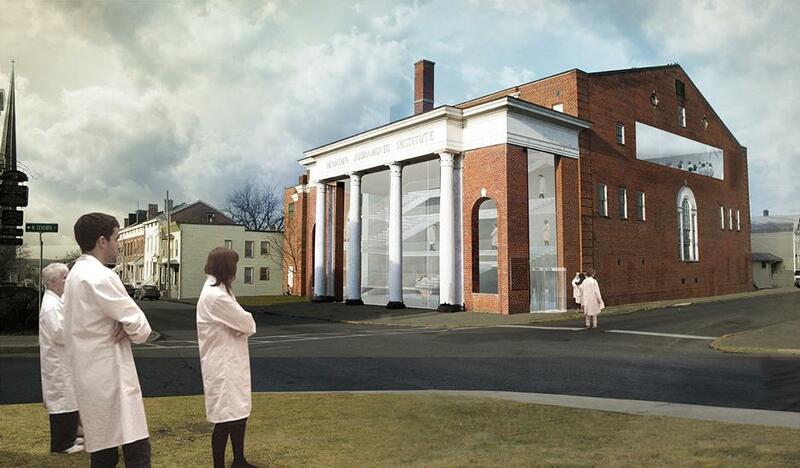 Neither a museum nor an archive, the Institute is to be a performance centre, not only for artists, but also for the general public. The idea is to educate anyone and everyone in the “Marina Abramović Method.” The MAI prototype that we had visited earlier that day is something of a preview for what might occur at the Institute. Visitors will remain in the future MAI for a minimum of six hours, or are welcome to stay for weekends or weeks at a time. She describes her “Cleaning the House Workshops” as multi-day retreats during which participants engage in a series of long-durational activities: fasting; sleeping in communal quarters; walking for hours at a time; standing barefoot in the snow; functioning only in slow motion or in hyper-speed; swimming naked in freezing water; crawling through barbed-wire fences and, of course, staring into one another’s eyes. The Institute, she argues, represents the ultimate conflation of performance and life. It is no longer about art, but about being useful to humanity in general. It is the collaboration between art, science, technology and community interaction. By engaging in these long-durational activities and experiments, she suggests, we can reclaim time from our techno-controlled accelerated society and perhaps transcend the perils and pain of contemporary life. She says she is attempting to build a new form of consciousness, a new form of culture, a new community. Again returning to her unwavering resolve to leave a legacy, she proposes the Marina Abramović Mission as an attempt to change the world through the Marina Abramović Method. She suggests that the surrounding city of Hudson might be transformed into a heightened community—some sort of enlightened super-group—that will improve and expand upon the Institute and help spread its message across the globe. She projects a map of the world, no longer divided by nations or borders, but marked only by the places where the Institutes will be erected. The term “The Artist is Present” will take on an entirely new dimension. This is unsettlingly like art as colonial power. At a certain point, the lecture started to feel like some sort of a self-help seminar: five steps to a better you, broken down by bullet points and sharp graphics. There was a cultish atmosphere to the whole thing that was generated more by the crowd than by their charismatic leader. There was a unified emotional reaction from much of the audience as they clapped and nodded emphatically for some of the seriously disconcerting statements she made about building what sounded like a super-human, ultra-engaged, utopian new world order. She provided a clichéd definition of what it takes to be an artist, called for unconditional trust and submission, and hugged an earnest young artist who rapturously expressed her admiration. The crowd kept clapping and nodding. We started exchanging nervous glances—much more adept now at sharing secrets with our eyes since that marathon staring contest earlier in the day—and each wondered what kind of a cult we were being initiated into. Why had we been so impacted by our experiences in the Prototype? Had we been hypnotized? Brainwashed? What did we really drink in that water?! And most importantly, might she actually be able to pull of this master plan?? To conclude the evening, the talk awkwardly turned to a plea for donations and it was at this point that we were ultimately shaken out of our spell. The head of marketing and social media was brought on stage and instructions were given as to how and where one could donate to make the MAI vision a reality. Indeed, a lot of money needs to be generated when Rem Koolhaas has signed on as architect, plans are set to build a functioning levitation room, and one can only guess the standard rate of pay for spirits these days. All that considered, the goal was set at $50,000,000. * It was around that point that we decided we had to leave and that maybe this wasn’t the cult for us. We’re just not that flush. However cynical this may sound, there was something seriously disconcerting about the event and the entire ideology of the Marina Abramović Mission/Method/Institution/immortalization/etcetera: the combination of charismatic leader and devoted followers; the advocating of physical struggle or sacrifice for enlightenment; and the communal living retreats imbue Abramomania with an undeniably cultish character. Indeed, neither of us has been able to shake the unnerving implications of a “new form of consciousness” or a “new type of community” built on tests of physical endurance, privation and isolation from everyday life. To take this to its most extreme, it feels like the oldest trick in the book: when deprived of food, sleep, or the comfort of communication for prolonged periods of time, one would undeniably be more susceptible or submissive to any messages imparted. And, if MAI were to change the world, what would happen to those who could not sustain such endurance? What of those with serious physical or psychological impediments? And what would happen to history, individuality or personal expression? The entire exercise necessitates some level of relinquishment and the acceptance of a new way to be. This new world order would demand a sort of survival of the fittest, which has undeniably assimilationist or even eugenicist implications. One of the strange ironies is that for someone who appears to be capitalizing on her past great achievements, the movement she is now attempting to catalyze is essentially a-historical and reminiscent of the generative/destructive dichotomy of the modernist tabula rasa. Indeed, history reminds us that, at its worst, this becomes art in the service of fascism. Of course, we are being hyperbolic here, and are in NO WAY implying that Abramović herself is advocating anything of the sort. We are also not suggesting that everybody in the audience was overtaken and converted to the cult. We must assume that other attendees felt a similar uneasiness about the whole affair. What concerns us is the wholesale investment in an artistic personality or icon of any kind who attempts an endeavour of such massive and utopic dimensions, and particularly in someone who asserts so seductively that she sees a better way for the world to function and thus centers herself on the path to enlightenment. Idealizing the sublation of art and life is nothing new—it is, in essence, the ideology of the historical avant-garde—but what is novel here is the enormity of her reach and the cultural capital of the Abramović icon. Her star power is blinding and the market constructed around her is powerful and prodigious. Once the idol is erected, it is open to interpretation and exploitation and a legacy does not necessarily lay dormant or stay put, but can be activated and engaged in any number of ways. While the cult of Abramović may appear innocuous at present – a fad amongst artists and admirers – it could also become something of a Trojan Horse of collective consciousness: it appears secure and unthreatening – apolitical, even – because it exists in the realm of art and philosophy, science and technology, and everything else that subliminally surrounds us, but its political implications are expansive. It appeals to a widespread desire for transcendence, personal connection and collective experience, as well as a growing dissatisfaction with contemporary conditions that, once engaged, risk uncontrollability. While we may have taken our interpretation to the outer limits of plausibility and sound rather paranoid at this point, we are not trying to discredit the artist or her institute entirely. We are ultimately grateful for the experiences we had and, as absurd as this may sound after everything we just said, we would even recommend you attend the Prototype if that particular circus ever comes to your town. The key, however, is to maintain a level of critical consciousness and keep a keen eye on reality while you are soothed into sublimity. We would advocate a 24-hour moratorium on value or quality judgments following such an experience to regain one’s footing and allow the effect to fade a little. There is a graffitied storefront that has remained unchanged for a couple of years in our Mile End, Montreal neighbourhood on which it is asked, “What if Art Ruled the World?” An innocent, if idealistic statement, it did little more for us than inspire a smile or a sigh on a particularly defeatist or dreamy day. After our close encounter with Abramomania, however, and our glimpse into a future whereby art has become life and life has become unrecognizable, the sentiment feels suddenly more serious. *Since publishing this article, it has been brought to our attention that we misheard the figure declared as the ultimate funding goal for the building of the Marina Abramović Institute and that the cost is actually set at $15,000,000 to $20,000,000. This is certainly still a lot of money, but much less than the amount we originally quoted. This entry was posted in Uncategorized and tagged Artist as Celebrity, Collective Consciousness, Contemporary art, Crystals, Cults, Immortalization, Legacy, Luminato Festival, MAI Prototype, Marina Abramović, Marina Abramović Institution, MOMA, Performance Art, The Artist is Present. Bookmark the permalink. Sensational first and last paragraphs. And everything in between. Great and gorgeous blend of personal journalism, scholarship, humour, cold criticism, warm vulnerability and hot drop-dead writing. It’s smart, funny, serious and scary. Well written, but i don’t think you could possibly understand what is Marian about (or after)… I am from former Yugoslavia too, more so- a Montenegrin as well and it does take some studies of our history and system we grew up within, so you can understand the subtle irony with which she does what she does… She’s a genius. We really appreciate your comments. It’s an interesting point you bring up. It is certainly true that we were raised in a very different cultural context, and there will always be some things that are not translatable. At the same time it is impossible not to be aware of the history behind her and her work, and we pay close attention to these differences. It is also true that MA is building her Institute in Hudson, New York and is promoting her project as a new form of global consciousness. One of the most troubling contradictions we have found is that while drawing heavily on her personal and political past, her MAI project implies a certain evisceration or transcendence of history in service of this new way of being. The consequence of her methodology is often a leave-taking, however temporary it might be, of one’s critical or ironic position. Even her own position is potentially undermined by the discord between her insistence on leaving a legacy and the negation of individuality that this utopia appears to require. We would be interested to hear more on your understanding of this irony and how it works, though. Thanks again, happy writing. Great article. I just found your blog in the Freshly Pressed section. I love the colors and texts you use. Very different, yet easy on the eyes. Thanks Elijah! And might we say, your blog is stupendous. Keep up the writing, you’re incredibly talented. To take this to its most extreme, it feels like the oldest trick in the book: when deprived of food, sleep, or the comfort of communication for prolonged periods of time, one would undeniably be more susceptible or submissive to any messages imparted. Spot on. It appears to me that the goal was to get people into a sustained alpha brainwave state, given the fact that you were obligated for 2 hours. Once you are in an alpha state, you are at least 25 times as suggestible as you would be in full beta consciousness. When you mentioned trance like states, I thought about the possibility of ELFs (undetectable to the ears) being present in the tents causing a cortical evoked response (brain synchronizes its own electric cycles to outside frequencies). Sitting motionless and silent for 30 minutes would make entrainment possible. Breathing exercises will also cause altered states of consciences. The oldest trick in the book is to get people in an alpha brainwave state before passing around the offering plate. Churches/clergy have been doing this (whether they are aware of it or not) for a few centuries at least. Wow. Just to assure you, we are writing this in full beta consciousness. We fully appreciate your comment, thanks. Always fascinating (if unnerving), to get a neuro-perspective. Touché. Although, it must be admitted, that we had to pay for this too… but that crystal water really was good. Fascinating account of an artist. It’s interesting to see how an artist will push themselves and then (possibly) push others in ways that are quasi-religious. As most schools of art practice grow up around charismatic individuals with a connection through some underlying philosophy – it’s interesting that performance artists often demand something more than like-minded colleagues to emanate them and a passive public to observe their products or outputs. The artist as a charismatic player able to conscript the observer into participating or acting as an object, or even becoming the media within the work itself, might be viewed as brilliant or could be (as you suggest) slightly worryingly delusional. I obvious won’t name the fascists who effectively did just that – but I agree it’s salient enough to know the divide can be blurry. Hi Chas, thanks for your keen observations, both of the article and the particular role Abramovic seems to be fulfilling as an artist. To be sure, as participants in art, as in politics and religion, it’s crucial to keep an eye on that always-blurry line. Great to read this one. I’m doing an online course (with about 10000 other people at the moment) – but our last assignment is a piece of art critique -so this was quite timely to read and think about. I might try to find something similarly confronting to ‘experience’ and take on to critique! Just found this gem in the ‘Freshly pressed’ section (new toWordpress!) it’s a pleasure to read something hyperbolic, playful but meaningful all in one space. Thank you. Welcome to WordPress, growyourwings. Thanks for reading and for your kind comments. Best of luck with your new blog! Hello! Thanks for reading and for your great feedback. We appreciate it. I think that it is really important that you both allowed the experience to “happen” to you, as well as asked all those questions and presented your concerns. 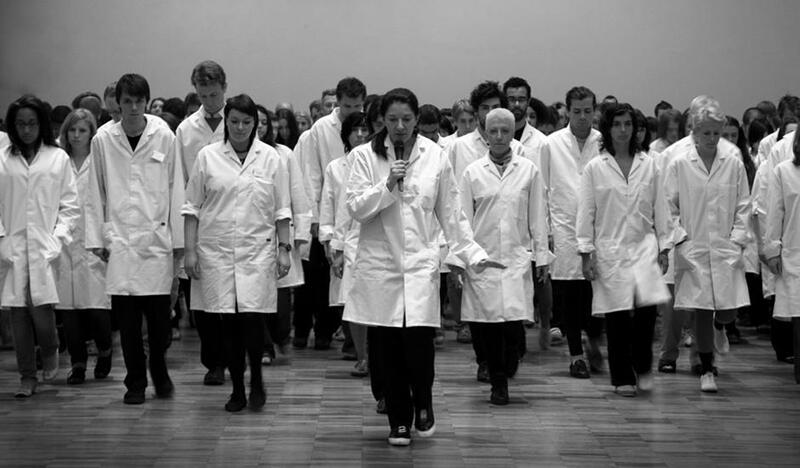 I am, for example, one of the people who supported the project on the kickstarter and although I am aware that it is a project of Ms Abramovic, I primarily see this institute to be as a platform for people from various artistic, scientific and liberal arts backgrounds to meet and create “their own art” together. And we don’t have enough adequate places like that in the world. The question is whether there is even one place like that. I certainly do not expect this institute to become a sect-like formation. Otherwise I wouldn’t have backed the project. I would think that what you experienced at the prototype MAI is one among many things that could be going on at the future institute at the same time. However, I did not attend an elaborate lecture by Ms Abramovic herself and I observe this idea from a different angle. It seems to me that as of now nobody really has a clue what such an institute could evolve into. The only thing to do is wait and see. But while I am waiting I choose to remain positive and supportive. Thank you for your comment and for sharing your interpretation of the institute. We certainly agree that the world could benefit from more platforms and spaces intended to generate productive collaboration between diverse individuals in the arts and sciences and are not closed off to the positive potential of the Institute itself. Of course, as you already know, we have our concerns, which we felt were important to address and to share with our readers. You are absolutely right that no one at this point can foresee what will come of the Institute in the future. We do believe that the best chance the Institute has of growing into something like the open, inclusive and inventive environment that you describe is the involvement and critical engagement of open-minded and inventive individuals. We too remain optimistic when supporters of the Institute – and even its staff – are interested in addressing all its issues and engaging in dialogue about how certain things can be improved or avoided. Those voices – yours included – are what might manage to counter the centrality of the Institute’s namesake and the risky cult of celebrity that surrounds her. We thank you again for your comments and wish you the very the best.